A highlight is South Bruny National Park, with towering cliffs overlooking long sandy beaches, coastal heathland, and underwater gardens of kelp seaweed with some amazing bushwalks to take it all in. The island is also a haven for many rare and endangered plants and animals. Take time to enjoy the famous local produce: Bruny is home to producers specialising in oysters, cheese and chocolate. Bruny Island Cheese make some of the finest artisan cheeses in Australia. Bruny Island is accessed via a 20-min crossing on vehicular ferry from Kettering, around a 35-min drive south of Hobart. The Bruny Island Ferry service runs seven days a week - get there early during peak holiday periods. The sheltered D'Entrecasteaux Channel, which separates the Tasmanian mainland south of Hobart from Bruny Island, was named eponymously by the French explorer Bruni D'Entrecasteaux in 1792. The channel became important for shipping between Hobart and the coastal bases of whalers, sealers and timber-getters further south. The far northern section of the channel between the mainland of south east Tasmania and the northern tip of Bruny Island is known as North West Bay. The larger bay to the south of it, between Woodbridge and Gordon, is called Great Bay. Though these two bays are treated as part of D'Entrecasteaux Channel, in reality the channel begins where the huon River estuary flows into it in near Verona Sands. One of the most memorable routes from Hobart to the Huon Valley is Channel Highway, the coast road alongside D'Entrecasteaux Channel through Taroona, where the world 's oldest round shot tower stands. Further on, there are superb sea views of Storm Bay and Bruny Island beyond. On the shores of the Channel south of Kingston is the little port of Kettering. Cruising yachts and fishing boats sit on their reflections in the sheltered harbour, and the busy Bruny Island car ferry plies its trade across the water. The Huon Trail is a journey of discovery through a region of waterways and wilderness, art and craft, forests and fishing boats, orchards and vineyards. Rich in pioneer heritage, the region is noted for its exceptional variety of landscapes, from the still waters of the tranquil Huon River to the magnificent forests of the Hartz Mountains National Park. With unbelievably fresh produce, beautiful countryside, wilderness and waterways, a drive down the Huon Valley makes for a great day's entertainment. If you can, it's worth staying overnight in one of the many small townships in the valley, but if time is short and you only have a few hours to spare consider a day drive and enjoy a taste of the Huon. The beautiful Huon Valley makes for one of the best drives in the state and it's just 30 minutes from Hobart. Leaving the city and passing behind the Wellington Range, you'll soon find yourself at Huonville and the start of the Huon Valley where the highway meets the mighty Huon River. If you are looking for lunch, you can't miss Home Hill Winery and Restaurant, for a feast of delicious Tasmanian delicacies, gourmet recipes made from good fresh country ingredients together with award winning wines. Call into the Kermandie Hotel for lunch or afternoon tea. Better still check-in for a night. It's a hidden gem. Return to Huonville then turn off for an alternative route back to Hobart along the meandering shoreline of the D'Entrecasteux Channel past the picturesque small townships scattered among the hills, including Cygnet (see below). There's also an award-winning winery, Hartzview Vineyard at Gardners Bay. As well as great wine, their Heritage Pickers Hut Village will let you experience the home of orchard workers and their families, and Italian prisoners of war in the early 1900s. Cygnet is a 50-min drive (55 km) south of Hobart. Known for its quirky creativity and home to potters, painters, writers, photographers plus the Cygnet Folk Festival (January every year) and the annual French Festival, Le Weekend (coming in April 2017) Cygnet is now something of a magnet. From "Australia" (as opposed to Tasmania) and from just about everywhere else on earth, people who are interested in good food, cool climate wines and glorious scenery visit the region in increasing numbers.People will tell you that less than 800 people live in Cygnet, but no-one's counted for a while; what's for sure is that weekends are particularly busy and vibrant, especially when the bi-weekly farmer's market is on (1st & 3rd Sunday of each month.) You'll find the market announced by hand-written signs stuck on trees and fences just a few days ahead. Very informal, Cygnet, but that's the spirit of the place. Check-out Frenchman's River for somewhere exceptional to stay. 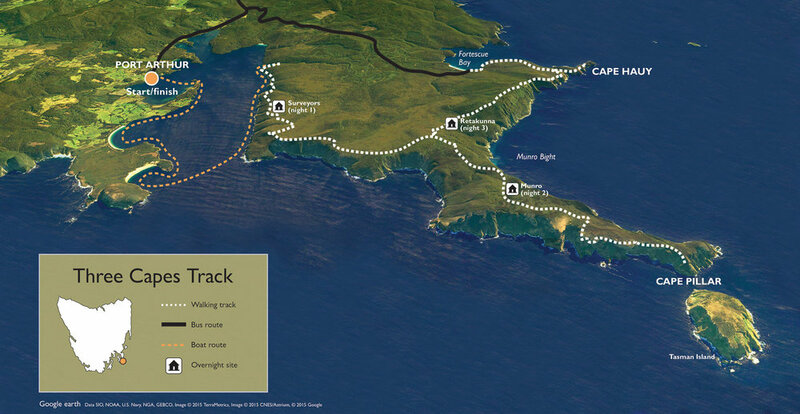 For those wanting to spend more time in this magnificent environment there's the Three Capes Track, an independent multi-day walking experience on the Tasman Peninsula. This 46 km journey leads through a myriad of natural landscapes with exhilarating cliff top outlooks on Cape Pillar, Cape Hauy and stunning views to Cape Raoul. Tasmania is gaining a reputation for wonderful food and wine enhanced by great chefs and restaurants. However, what they produce is really the end of the story. To get a real idea of Tasmanian produce, we need to start at the beginning, with our producers. Many people come to Tasmania already knowing about our salmon but there is so much more and some are a real surprise. For example, we have a thriving saffron industry driven by Nicky and Terry Noonan; they started in 1991 and now have a network of growers who supply Category 1 Saffron, the best rating in the world. Many people don't expect to find a saffron industry in Australia, let alone in Tasmania. Nicky and Terry are incredibly passionate about their produce and that's evident in the quality of their product and the fact that they're collaborating with the University of Sydney in trials of the medicinal benefits of saffron. Olive oil is another product that causes raised eyebrows as most people equate growing olives to warmer climates. There are many olive groves in Tasmania from large commercial groves to small backyard ones however they all have two things in common, the passion of the producer and the fact that they all produce wonderful oil full of flavour. So why is our oil so good? Well, the cooler climate means lower yields result in more nutritious and stronger flavoured oil. Tasmanian extra virgin oil has a free fatty acid level that is four times better than the standard set by the International Olive Oil Council. Some of our wonderful award winning oils to lookout for are Renaissance Olive Oil, Island Olive Grove and Cradle Coast Olives to mention just a few. When most people think of Wasabi they think of Japan so it may come as a surprise to know that we grow wasabi in Tasmania. Currently there are four growers, including Shima Wasabi, and they are hard pushed to keep up with the huge demand from Australian restaurants and wholesalers. We also export Tasmanian wasabi to selected overseas destinations including some Asian countries. Tasmania is the only place in the world that produces leatherwood honey. The trees grow in remote rainforests in pristine World Heritage areas with some beekeepers spend weeks out in the wilderness with their bees, moving the hives around to ensure the bees have easy access to the flowers. Tasmania's leatherwood honey is grown in a pristine environment with love and passion. So when you're planning a foodies trip to Tasmania, look for food tours, go to the local markets and check out the roadside stalls, not to mention our award-winning restaurants - and remember - it all starts with the producers.